Jesuit has a growing string orchestra program, starting with beginning strings instruction in 9th grade. 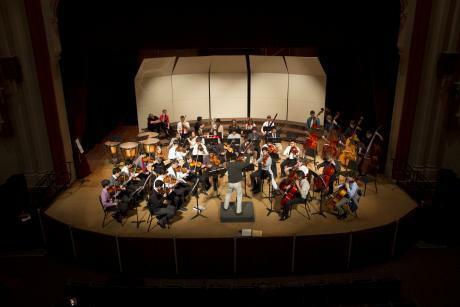 To enroll in our Intermediate Orchestra, students should have a solid command of their instrument (violin, viola, cello or double bass), be able to play several major and minor scales, and have established proper playing technique. Students study standard classical literature as well as contemporary selections. Intonation, dynamics, articulation, rhythmic accuracy and Musical interpretation are emphasized and refined. Students will continue to develop independent practice habits. There will be multiple required performances, including winter and spring concerts. Honors Orchestra is an audition only class open to all string students who demonstrate a high level of technical and musical proficiency and the interest in improving these skills to attain the highest level of artistry possible for both the individual and the ensemble. The primary goal of this course is to foster the growth of the individual musician and teach music as an art form through study and performance. Instruction will include, but not be limited to, rehearsal in large and small ensembles, listening, lecture, and public performance. Join our Alumni Mailing List and stay up-to-date with everything at Jesuit VPA!